1353-1354 Although the short reign noted him here might suggest a brief and unimportant ruler, that of John VI is far from it. John Catacuzenus, as he was known to his contemporaries, was a leader of the highest order whose influence in Byzantine politics transcended the better part of the 14th century. Cantacuzenus had been the legal and military advisor, as well as the closest friend, of Andronicus III. He served with such distinction and competence that Andronicus felt indebted to him for all his major successes. Although he tried several times promoting him all the way to the position of co-emperor John steadfastedly refused the honors, preferring instead to stay in the background and help as it was asked of him. When Andronicus died he had left no named successor in mind. His son, now referred to as John V for the sake of imperial chronology, was just a kid and most would have preferred to make Cantacuzenus his regent, if not the outright emperor instead. However, he still refused and would only accept his unofficial role of advisor and imperial friend. This humble stance, unfortunately, made matters a lot worse for all Byzantines as a power struggle began brewing. A nasty civil war erupted, much to the delight of the barbarians and Turks and Italians and everyone else, that then rendered Constantinople and its few affiliate possessions that much weaker. Add to this the decimating effect of the Black Plague which blew through town in 1347, earthquakes, frequent riots, etc. and their situation seemed all but hopeless. Still, with what seemed like an infinite amount of patience and dedication, Cantacuzenus sorted out imperial hierarchy and ecclesiastical squabblings to bring order. He was finally (and quite reluctantly) made emperor and co-regent of John V along with his mother Anna. He also elevated his own two sons to high titles and each given their domains. But the empire was just suffering too many ailments that one man, however bright and capable could have resolved. When John V grew up enough he started started voicing his claim for sole rule. To add a little weight to his demands he immediately started making trouble and giving indication that another round of civil war would break out. Understandably, Cantacuzenus had had enough and soon abdicated and retired to a monastery with his wife. 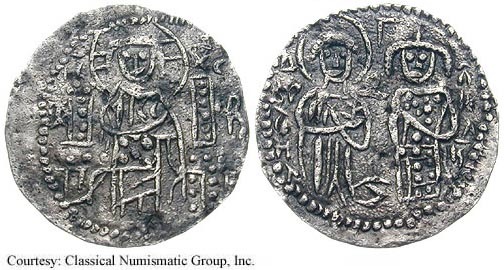 Numismatically, coins bearing the impression of Cantacuzenus cover most of the joint reign between him and John V. Those coins attributed to him alone were minted during the year or so that John V had renounced their joint reign and in which he was forced to become sole emperor by default. Given the crises of the times and the short duration of this arrangement those coins are understandably very rare and difficult to find. SB 2540, Bendall 301 AR Basilikon Obv: Christ enthroned facing; sigla: B/K N (reverted) at sides. Rev: KTKZN GOD DMHTR - John and St. Demetrius standing facing. 1353-1354 (Constantinopolis). $2,200 5/21/03. SB 2542, Bendall 303 AR Basilikon Obv: Christ enthroned facing; sigla: F/P B at sides. Rev: John and St. Demetrius standing facing. 1353-1354 (Didymoteichon). $2,825 5/21/03.